Norland Epperston 3 Room Log Cabin: The Norland Epperston 3 Room Log Cabin is a versatile building offering three interior rooms and a covered extension to the front. This stunning cabin lets in lots of natural light, with large windowed bifold doors at the front, three windows in the main room, and one window in each of the two rear rooms. The 70mm wall logs and double glazing offer great sound and heat proofing, which makes the Epperston a secluded and quiet sanctuary year round. The covered extension at the front offers the perfect place to sit and enjoy your garden, and with its bifold doors and tilt and turn windows the cabin can be kept well ventilated during the summer months. 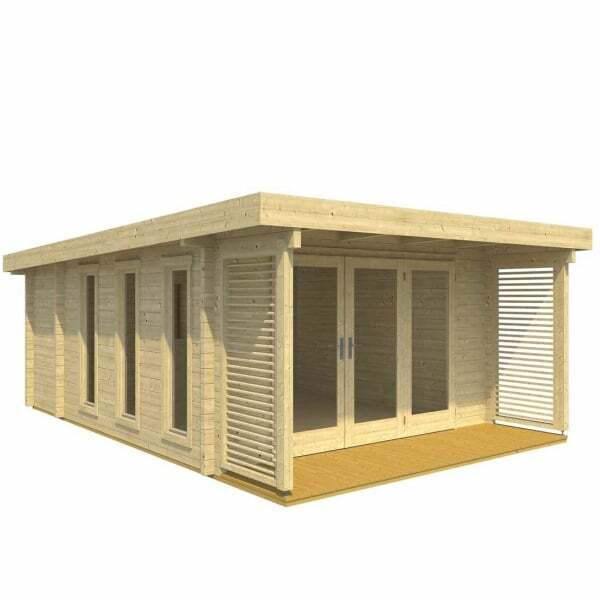 The Norland Epperston 3 Room Log Cabin is easy to assemble and is an extremely sturdy structure as they are built in the traditional Log Cabin style and therefore use no screws or nails in the wall construction. The Norland range also feature chalet corner jointing to give that extra timber jointing for extremely good weather resistance.